Formlabs New Castable Wax Resin - 3DHUB.gr - Το πρώτο 3D printing HUB στην Ελλάδα! Ο κορυφαίος Formlabs Form 2 SLA 3D printer μόλις απέκτησε και κορυφαία χυτεύσιμη ρητίνη! Η νέα Castable Wax Resin, με 20% κερί για αξιόπιστη και επαναλαμβανόμενη χήτευση, με καθαρό και γρήγορο burnout χωρίς υπολείμματα και χωρίς ανάγκη για uv cure, είναι βελτιστοποιημένη για καθαρές επιφάνειες και μέγιστη λεπτομέρεια ακόμα και σε λεπτές δομές και filigree! Formlabs is pleased to announce that Castable Wax Resin, the newest addition to our library of Jewelry Resins for 3D printing, is now shipping! This wax-filled material is designed for reliable direct investment casting with zero ash content and clean burnout. Printed parts are suitable for both custom try-ons and final production. The way jewelers work is changing, and castable photopolymer resins are leading the way. From independent designers concepting and prototyping in their studios, to casting houses increasing capacity and diversifying their offerings, digital fabrication techniques are increasingly key to growing a successful jewelry business. Capable 3D printing materials like Castable Wax Resin are helping jewelry designers and manufacturers scale their production in-house.Highly capable equipment and materials help designers and manufacturers free up time that would be spent making or preparing pieces by hand. With affordable, intuitive desktop 3D printing options like the Form 2, high quality 3D printing is increasingly accessible and scalable for jewelers at all levels. Highly detailed and challenging jewelry is complicated to produce by hand, and in a world driven by high demand and fast fashion, it can be difficult for hand-crafted pieces to keep pace. Castable Wax Resin was formulated to set the standard for print quality on an affordable desktop 3D printer, combining the smooth surface finish that stereolithography (SLA) 3D printing technology is known for with increased part strength and precise print settings to capture astonishingly sharp detail. Accurately capture fine features, like raised text, delicate filigree wires and meshes, and detailed pavé, with no visible layer lines. By focusing on the most challenging geometries, such as filigree, during product development, we were able to create a material capable of accurately printing designs of all kinds. Asia Pacific is the largest global market for jewelry in terms of retail value, producing in huge volumes. 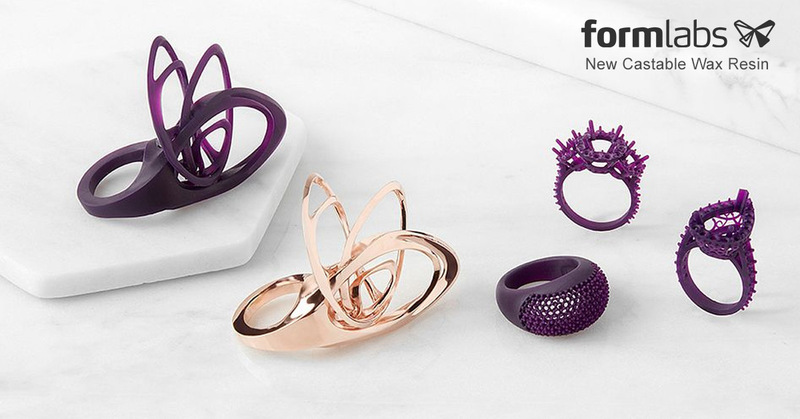 The Formlabs product development team worked closely with jewelry manufacturing partners in China, Japan, and India to ensure that Castable Wax Resin could reliably print challenging ornate pavé pieces and large filigree bracelets, which are particularly popular in those regions. By focusing on the most challenging geometries during product development, we were able to create a material capable of accurately printing designs of all kinds. Castable Wax is our best all-around material for investment casting, and is strong enough to be used for initial test fittings or prototyping designs. See Castable Wax Resin’s crisp accuracy and smooth surface finish firsthand: request a free sample pavé dome ring. Castable Wax is our best all-around material for investment casting, and is strong enough to be used for initial test fittings or prototyping designs. Castable Wax Resin is 20% wax-filled for clean, easy casting with fast, reliable burnout. This material is suitable for a standard burnout schedule or a short 8-hour burnout schedule using strong investments like R&R’s Ultravest Maxx, developed specifically to withstand faster heating for photopolymer casting. This resin does not require post-curing, making part preparation fast and foolproof–no wondering if a part is fully cured and ready to cast. After a quick wash in isopropyl alcohol, parts are clean and ready to handle, with no residual tackiness. The Standard Burnout Schedule is recommended for overnight cycles and for larger flasks and heavier geometries. 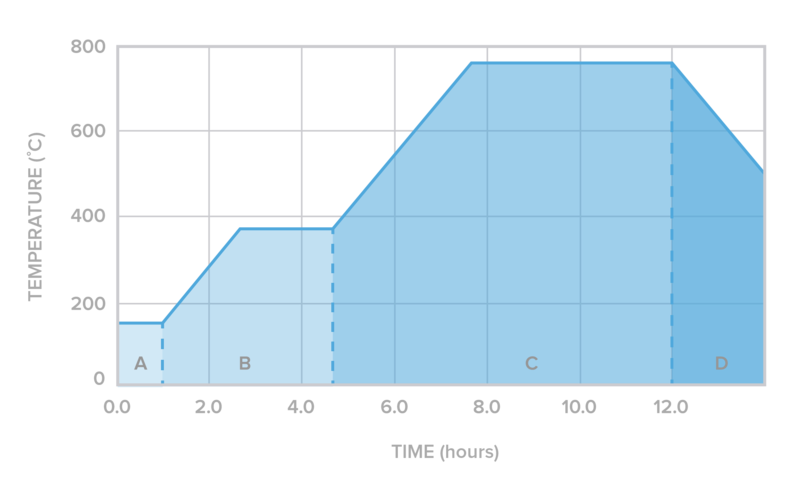 The Standard Burnout schedule is designed to provide the maximum possible investment strength and complete burnout of the finest details using R&R Plasticast or similar investment materials.